Trial qualification in Vitally allows you to cut down on the noise caused by unqualified leads signing up for trials. 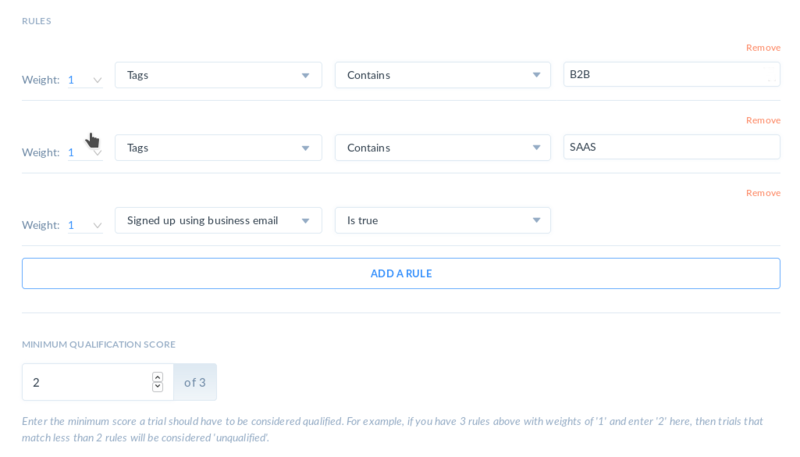 By setting up trial qualification rules, you can assign a score to every trial that signs up for your product. You can then set a threshold for which scores cause a trial to be qualified. 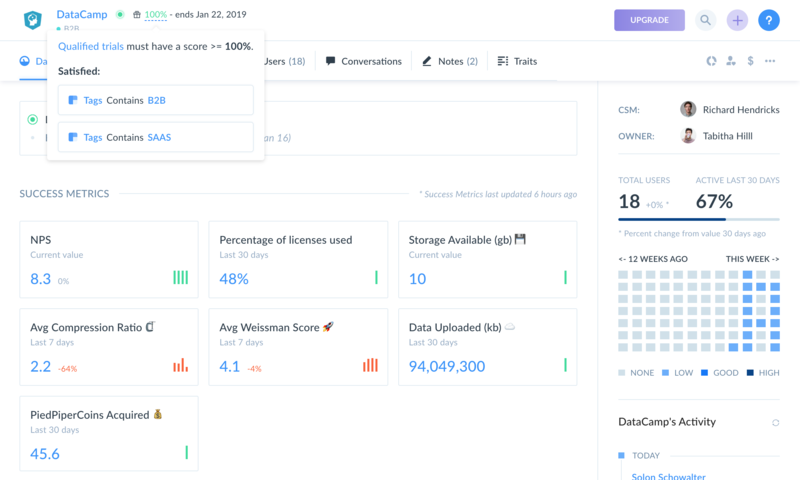 Sifting through all the trials that sign up for your product and deciding which you should be spending time on can be time consuming, and you might end up missing a great revenue opportunity. That's why Vitally has built in automated trial qualification rules that allow you to assign a trial qualification score to every trial. Each rule has a condition on either the traits you send us or enriched traits fetched from Clearbit, plus a weight. The trial qualification score for a customer is the sum of the weights on every rule that matches that customer's traits. The minimum qualification score determines which trials are categorized as unqualified. If their qualification score is less than the minimum qualification score, they will be marked as unqualified. After 5 days, if they have not been manually marked as qualified or had their traits updated such that their score increases, they will be ignored. Clearbit enrichment can provide important context, like sector, market cap, and technology, for deciding whether or not a trial is qualified. 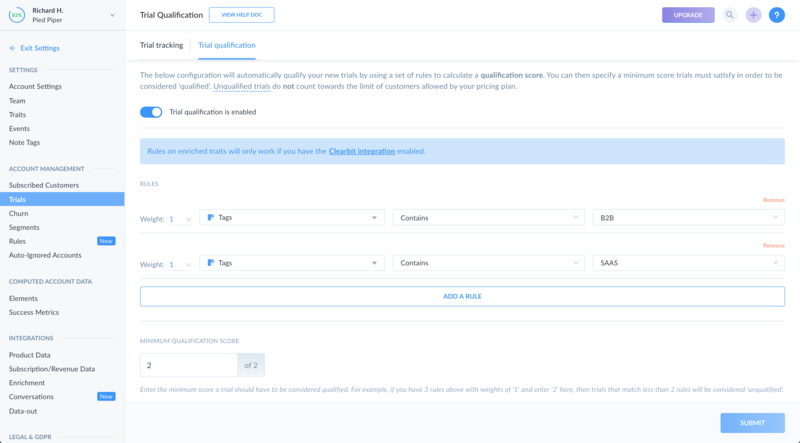 We highly recommend enabling the Clearbit integration for advanced trial qualification. Unqualified trials are displayed for 5 days in the "unqualified" tab of the trials explorer. After 5 days, they will be automatically ignored, and will no longer be displayed in Vitally. You can search for ignored customers using the search box if you'd like to un-ignore them. Each trial's qualification score is displayed in that trial's dashboard, as well as in a column that you can add to the trials explorer for sorting and filtering. Hovering over the qualification score displays a summary of how the score was calculated. You can overwrite a trial's qualification status to qualified/unqualified without affecting their assigned score. For example, you may want to move a trial to qualified even though it did not pass your qualification threshold. To do so, either select the unqualified trials in the Accounts view or navigate to the trial's dashboard and click the dollar icon to mark them as a qualified trial.